Prose and Writing: Engaging. Personable. The kind of cookbook where a friend who loves food tells you about things. Also educational. Photography and Layout: No photos. Simple layout. Nothing to write home about it, but it works. Other Book Notes: Mine was the softcover which makes it easy for pencil writing. Usefulness Factor: 3.5/5. 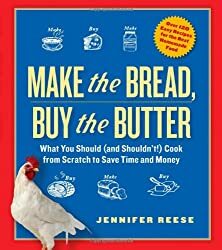 Some of these recommendations of buying vs making are more obvious to intermediate home cooks. I think it’s personal and depends on where you live. Having said that, I’d still give this a good rating because of the variety of at home recipes provided. There were times when I did want to make dumpling wrapper for pot stickers, but this book taught me otherwise. The tested recipes factor is great too. Inspiration Factor: 3.5/5. I want to own chickens too. Milk Mayonnaise – This didn’t work for me. Immersion blender or whisk, but maybe I didn’t pour the oil slowly enough. I don’t use mayonnaise much either. Emulsifying things has always been a tricky thing for me. Lemon Extract – Used only one lemon for about 100-120ml of vodka. Yet to be determined if it’ll be good or useful. 1. Clean everything being used with hot soapy water and allow to dry. Wash hands thoroughly. 2. Remove any outer leaves from the cabbage, cut cabbage and remove inner core. Slice cabbage thin and chop into pieces about 1 inch long. In a large bowl, toss with other ingredients, massaging the salt into the shreds. If you have time, let the cabbage macerate for 1 or 2 hours at room temperature. 3. Pack the cabbage tightly into a wide-mouth quart or 1L canning jar. Find a smaller jar that will fit inside the rim of the quart jar–a jelly jar, for instance. Fill it with water and cap it tightly. Place it on top of the cabbage and press down so the juices are forced up and over the vegetables. Cover the whole contraption with a clean apron or T-shirt and tie tightly around the middle. You want the kraut able to breathe, but inaccessible to flies. 4. Place the contraption on a tray on the counter (Occasionally, the jar will overflow). Press down every few hours to make sure that the liquid covers the lettuce. 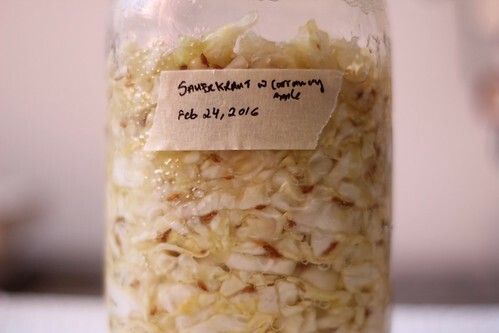 Let the kraut ferment at room temperature, tasting daily. Skim off any foam, gunk or mold as desired. When you like the flavor, dismantle the contraption, cap the jar, and store in the refrigerator. 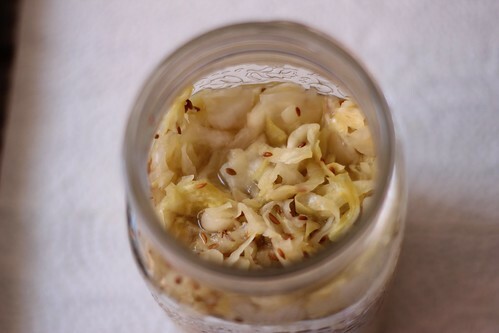 Helpful notes from various blogs and this The Kitchin post on sauerkraut and video on cabbage cutting. Did not use whey, but I guess I could use a bit in the future since I make kefir as well. Macerated 2 hours. I think it helped get the process going. Used sea salt, but I’d like to use my kosher salt next time. Used a small empire apple. Used an old T-shirt but did not wrap it tightly and put the whole jar in a small cereal bowl. 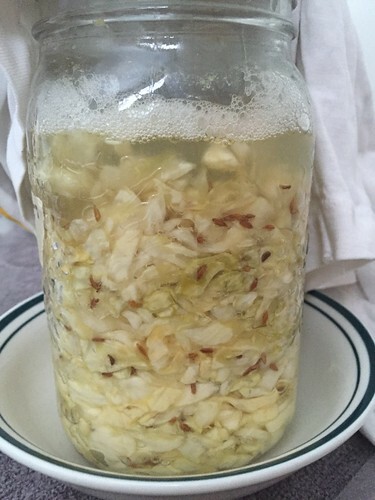 Put my kraut in fridge after 11 days. At that point, it was sour and tart enough for me. Next time, I’ll do a standard 3-4 week fermentation. Double this recipe so I can use two 1L mason jars or a 1 gallon/1.8L jar. Keep the caraway seeds and the apple, but even when doubling, use a big apple rather than two. I’ve read too much apple or sweet veg is not great for the kraut. Other spices: black peppercorns, a couple bay leaves, juniper berries, cumin seeds and dill. 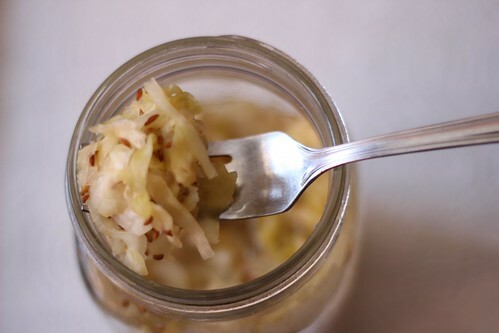 Make it at my parents’ home because I have a tiny kitchen and finding a place for one jar of sauerkraut was not easy. They also have a basement and cold room for extended storage ideal for fermentation.